Martha Bryan Schott Whitney [Mrs. Elisha D. Whitney, d. 1889], great-granddaughter of the sitter. James S. Whitney. (C. K. Johnson, Greenwich, Connecticut); sold 1 February 1923 to Thomas B. Clarke [1848-1931], New York; his estate; sold as part of the Clarke collection 29 January 1936, through (M. Knoedler & Co., New York), to The A.W. Mellon Educational and Charitable Trust, Pittsburgh; gift 1947 to NGA. Catalogue of the Paintings and Other Objects of Interest Belonging to the Historical Society of Pennsylvania, Philadelhia, 1872: 8, no. 9. Mrs. Whitney deposited the portrait at the society on November 11, 1872. She was Matlack's great-granddaughter; her mother Rebecca Bryan Schott (Mrs. James Schott, 1787-1871), was the daughter of Matlack's daughter Martha Matlack Bryan (Mrs. Guy Bryan, 1770-1814). (Information in NGA curatorial files). The evidence of James S. Whitney's ownership of the portrait is an undated handwritten label on the back of the frame, which reads: "Timothy Matlack/ Born Haddonfield NJ/ in the year 1730, and Died near/ Homesburg, Pa. April 15th 1829/ Deposited by James S. Whitney, and subject to his order." His relationship to Mrs. Whitney, the previous owner, is unknown. Her will (Philadelphia Register of Wills, W-1225-1889, and that of her husband (Philadelphia Register of Wills, W-64-1888) do not mention a James S. Whitney. Anna Wells Rutledge and James W. Lane, "110 Paintings in the Clarke Collection", unpublished typescript, NGA Department of Curatorial Records, 1952: 144, suggested that James S. Whitney was her brother (probably an error for "brother-in-law"). They note that he withdrew the portrait from the Historical Society sometime after 1907. The will of a James S. Whitney (died 1921; Philadelphia Register of Wills W-1045-1921) lists his address as 1627 Sumner Street, and indicates four children: Asa W., Thomas B., Anne Wakefield and Emma S. Whitney. Thomas was given all the "books, pictures, furniture and other articles" not specifically given to other children; however, the inventory lists only "5 oil paintings," and these are probably the "five marine paintings by James Hamilton" specifically given to his daughters. C. K. Johnson offered the portrait to Clarke in his letter of 27 January 1923 (NGA Clarke files). The date of purchase and name of the seller are recorded in an annotated copy of Portraits by Early American Artists of the Seventeenth, Eighteenth and Nineteenth Centuries Collected by Thomas B. Clarke, Exh. cat., Philadelphia Museum of Art, 1928 (NGA Library). Loan to display with permanent collection, Historical Society of Pennsylvania, 1872-c. 1907, as by Charles Willson Peale. Exhibition of the Earliest Known Portraits of Americans by Painters of the Seventeenth, Eighteenth and Nineteenth Centuries, The Union League Club, New York, March 1924, no. 4, as by Charles Willson Peale. Portraits by Early American Artists of the Seventeenth, Eighteenth and Nineteenth Centuries, Collected by Thomas B. Clarke, Philadelphia Museum of Art, 1928-1931, unnumbered and unpaginated catalogue, as by Charles Willson Peale. Historical American Paintings, Department of Art, Golden Gate International Exposition, San Francisco, 1939, no. 17, as by Charles Willson Peale. The One Hundred and Fiftieth Anniversary Exhibition, The Pennsylvania Academy of the Fine Arts, Philadelphia, 1955, no. 4, as by Charles Willson Peale. The Peale Family: Three Generations of American Artists, Detroit Institute of Arts; Munson-Williams-Proctor Institute, Utica, 1967, no. 147, as by Rembrandt Peale. Catalogue of the Paintings and Other Objects of Interest Belonging to the Historical Society of Pennsylvania. Philadelphia, 1872: 8, no. 9. Cortissoz, Royal. "The Field of Art." Scribner's Magazine 76 (1924): 112, repro. 110. Portraits by Early American Artists of the Seventeenth, Eighteenth and Nineteenth Centuries, Collected by Thomas B. Clarke. Exh. cat. Philadelphia Museum of Art, 1928, unnumbered, as by Charles Willson Peale. Sherman, Frederic Fairchild. Early American Painting. New York, 1932: 58. Sellers, Charles Coleman. 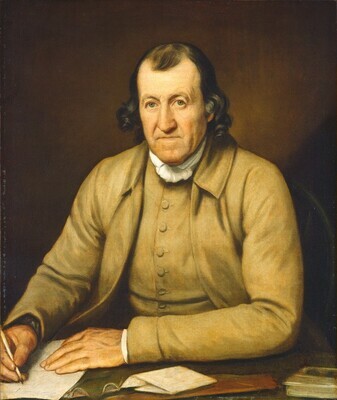 The Artist of the Revolution: The Early Life of Charles Willson Peale. Hebron, Connecticut. Reprinted as Charles Willson Peale. Vol. 1: Early Life (1741-1790). Philadelphia, 1947: repro. opp. 208. Rutledge and Lane 1952, 144-145. Sellers, Charles Coleman. "Portraits and Miniatures by Charles Willson Peale." Transactions of the American Philosophical Society 42 (1952), part I: 140, cat. 538, and fig. 103. Elam, Charles H., ed. The Peale Family: Three Generations of American Artists. Exh. cat. Detroit Institute of Arts, 1967: 107, no.147, repro. 61. Sellers, Charles Coleman. Charles Willson Peale with Patron and Populace. Transactions of the American Philosophical Society n.s. 59 (1969), part 3: 71, under SP88. American Paintings and Sculpture: An Illustrated Catalogue. National Gallery of Art, Washington, 1970: 88, repro. American Paintings: An Illustrated Catalogue. National Gallery of Art, Washington, 1980: 206, repro. Miller, Lillian B., Sidney Hart, and David C. Ward, eds. The Selected Papers of Charles Willson Peale and His Family. Vol. 2: Charles Willson Peale: The Artist as Museum Keeper, 1791-1810. New Haven, 1988: 285, fig. 50. American Paintings: An Illustrated Catalogue. National Gallery of Art, Washington, 1992: 257, repro. Miller, Lillian B. In Pursuit of Fame: Rembrandt Peale, 1778-1860. With essay by Carol Eaton Hevner. Exh. cat. National Portrait Gallery, Washington, D.C., 1992: 49. Torchia, Robert Wilson, with Deborah Chotner and Ellen G. Miles. American Paintings of the Nineteenth Century, Part II. The Collections of the National Gallery of Art Systematic Catalogue. Washington, D.C., 1998: 72-75, repro.